There was a time in my life when my favourite shop in the entire world was on Oxford Street. Every other weekend, I’d get the bus into town clutching a list of the best songs I’d heard on the radio that week, most of them on John Peel’s Radio 1 show, and see which of them the giant HMV could sell me. Which was most of them, as a rule, and sometimes on special edition gold vinyl. Even then, though, I’d have preferred my favourite shop to be somewhere else. Away from all those people. I could spend hours in that shop, choosing what I could afford and lusting after what I couldn’t, but the moment I emerged, bag in hand, I’d be off, straight down a side-steet or alleyway. The amazing thing about Oxford Street, then as now, is that you need only take 10 paces away from it and you can find peace. Philglass & Swiggott’s central London branch is not my favourite shop in the entire world, though if I lived nearby it would probably be quite close. Set in a remarkably peaceful location a cork’s pop from Marble Arch, it can’t really be bracketed with Oxford Street’s other wine sellers (of which more on another day, quite possibly), the John Lewis Food Hall and Selfridges. Not only is it not really on Oxford Street, but the other twoboth of which and particularly the latter catering for the, well, showier end of the market – let’s just say they both stock Cristal, and Selfridges has a few vintages of Petrus for good measure. 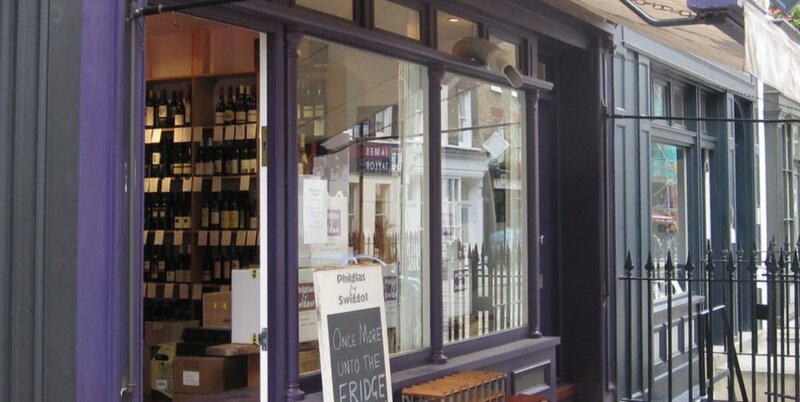 None of that here, with P&S promising “a range of interesting wines from mostly smaller producers, a sort of antidote to the increasing anonymity and sameness of the big chain stores”. Lots of it is new to me, probably around 40% French, with pretty much every bottle accompanied by a hand-written description – quite a task, this, so it’s probably too much to ask for the descriptions to be legible (mostly they can be puzzled out, to be fair). It’s a welcoming, spacious-feeling shop (though it helped that nobody else was in it), the single member of staff tap-tapping on his computer and bothering me not a jot. Some people would call this bad service, but I’m much happier to be left to my own devices. Maybe he got that impression, though he probably just knew it would take a while to decypher those descriptions. As a rule if I want help, I’ll ask for it – and when I did, he was courteous and clearly enthusiastic, and gave me a choice of two whites, one from Portugal and the other from Hungary. I’d never had a dry furmint so I went with that, and made up for it by choosing a Portuguese randomiser. So I was thinking, Hungary’s got to be a pretty cheap country to make wine in. Cheaper than France, or Italy, or America, say. And given that £13 can get you a pretty decent wine from anywhere, it should get you something smoking hot from Hungary. By that logic, this is a bit of a disappointment. But if it’s not the blinding bargain I had hoped for, it’s still a lovely wine, with flavours of apple and elderflower, plenty of body and lots of mouthwatering acidity. Its smell is more than anything redolent of the honeyed scent of sweet furmint, which apart from being a little disconcerting for a dry wine, is really quite beguiling. Lovely. This entry was posted in Shopping and tagged Azamor, dry furmint, Hungarian white wine, London wine shops, philglass & swiggott, Portuguese red wine. Bookmark the permalink.